I’ve mentioned several times before that Mexican Food or any variation thereof is my kryptonite. For me, a diet doesn’t seem like so much of a diet if I can have the things that I love. And, I love TACOS! Fish tacos are a great way to keep the flavor of Mexican food but still stay on your low carb/keto diet. 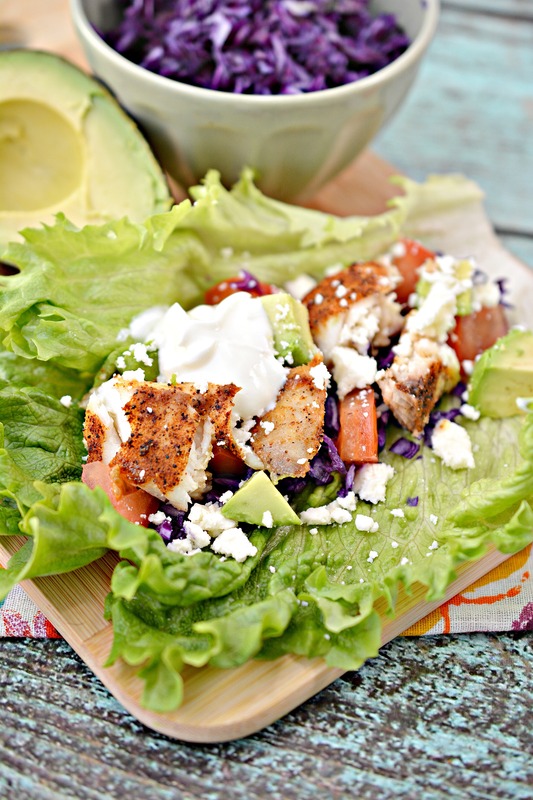 The lettuce wrap fish tacos are not only easy, but incredibly filling and delicious! Give them a try and let us know what you think! 2. Drizzle the olive oil over the tilapia fillets, and apply salt and pepper to taste. 3. In a small bowl, combine the paprika, chili powder and cumin. Mix to combine. 4. Sprinkle the herb mixture over the tilapia, and rub it in with your hands on both sides. 5. Bake the tilapia fillets for 20 minutes. 6. While the fish is baking, prepare the filling for your tacos. Shred the red cabbage, chop the tomatoes and avocado, and crumble the queso fresco cheese. 7. To assemble your fish tacos, cut the fish fillets into bite sized pieces. Place a large leaf of lettuce down, and top it with some shredded cabbage, 1 tbsp of chopped tomato, some chopped avocado, some of the fish pieces, and a dab of sour cream.